I promise this video will brighten your day. A woman named Amanda Boxtel, who's been a paraplegic for 18 years, straps on a pair of robotic legs and goes for a walk. She couldn't possibly smile any harder. The eLEGS are made by Berkeley Bionics. After working for several years on robotic exoskeletons that help able-bodied people carry heavier loads, the group licensed that technology to Lockheed Martin to develop for the military. Now Berkeley Bionics is focusing on a different project: giving paralyzed people the power to walk. The eLEGS are a kind of frame for the legs, attached to a backpack. To use the legs, a person straps his or her body into the frame and stands up with the help of two crutches. Sensors in the crutches tell the robotic legs when the user is trying to take a step, and the legs respond by bending in a near-normal walking motion. Batteries keep the legs going for up to six hours at a time. The current prototypes of eLEGS can only travel in straight lines. But next year, clinical testing will begin on models that should be able to make turns. And Berkeley Bionics hopes to release eLEGS to the public by the second half of 2011. Besides giving back a degree of mobility and independence to long-paralyzed people, the legs might be therapeutic for those with more recent spinal injuries; they'll be able to keep their bodies upright and moving around, instead of settling their muscles into an all-seated lifestyle. Though the paraplegics who've tested the system won't be entering any footraces--they can't travel much more than two miles an hour--they are thrilled just to stand up and see people at eye level. Leaving the lab to test the legs outdoors, Amanda creeps along a tree-lined path and shouts, "I'm doing it!" Definitely less heartwarming, but also pretty cool, are these Pseudomonas bacteria. Researchers recently discovered that not all Pseudomonas scoot around in the same horizontal fashion. Some use little arm-like structures called pili to stand upright and "walk" around. 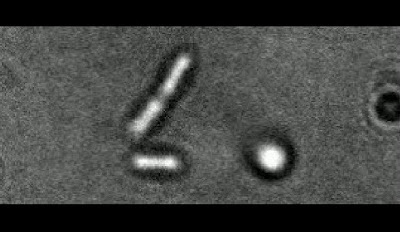 Here, you can watch a video of one bacterium turning itself vertical and wandering off. Hallelujah!